Look at this fanciness! Sometimes it’s fun to be French and fancy. And then add sprinkles. I first made macarons in pastry school, and I remember being surprised and actually a little bit disappointed at just how simple they are to make. I mean, these are macarons. French ones! These dainty little pretties line the windows of the best French bakeries, taunting us Americans, we with our thick crusted pies and face-sized cookies, looking all sloppy and oafish in comparison. Stupide, they say, look at how delicate we are! Look how elegant, how sophisticated! Out of your league, girl. Five ingredients! All you need. Just some almond flour, some egg whites, some sugar, some cocoa. Yes, there’s some finessing with a pastry bag to conquer, but you’ll do it. You’ll conquer. You’ll carpe the diem. Your friends will ooh and ahh, and you’ll speak some broken french — merci! Oh, les macarons? De rien! — and only you will be the wiser. You and me, I mean. But don’t worry — c’est notre secret. Use a blender or food processor to finely grind together the powdered sugar with the almond powder and cocoa so there are no lumps. Pipe the batter on the parchment-lined baking sheets in 1-inch circles (about 1 tablespoon each of batter), evenly spaced one-inch apart. If using sprinkles, add a few now, so they stick to the wet batter. 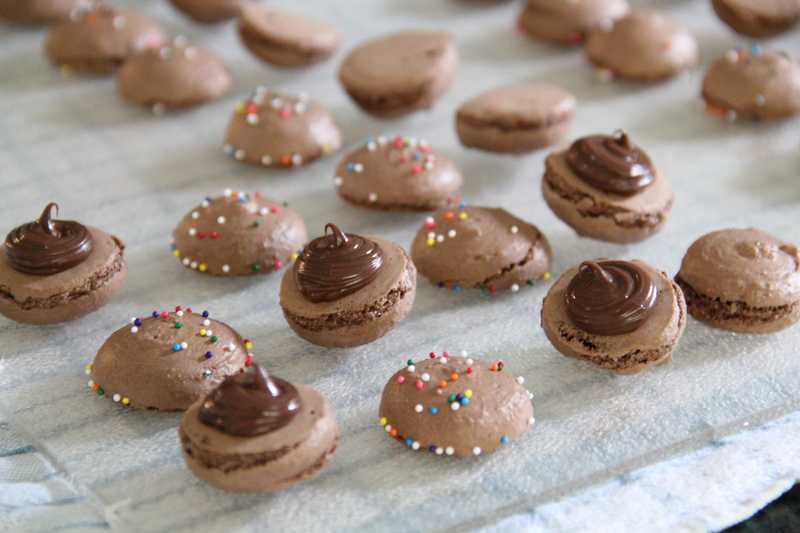 Spread or pipe a dollop of jam or Nutella on the flat side of half of the macarons; use the other half to complete the little sandwiches. 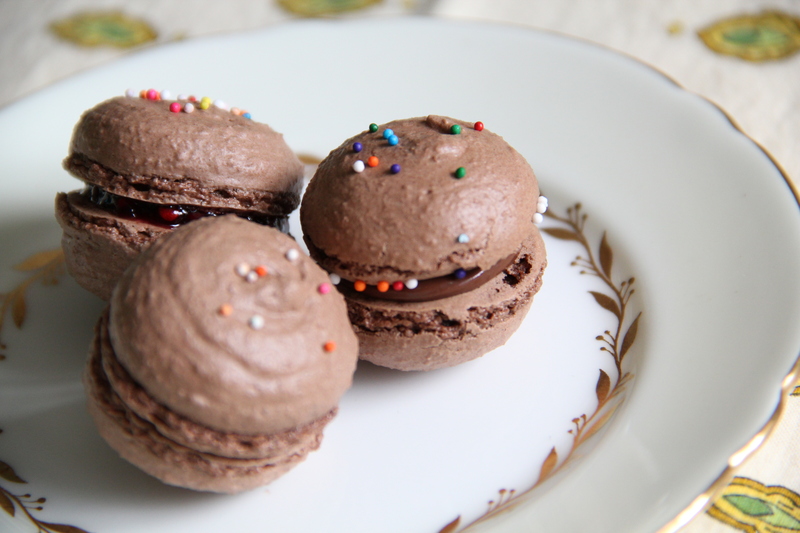 Enjoy the macarons as soon as possible. They will keep for 2-3 days in an airtight container at room temperature. you taught me how to do the pastry bag; now i NEED to do it on my own!!! love you, chef Molly! you continue to amaze/delight………. I had NO IDEA that these are so easy to make! I drool over them every time I see them. Now I could drool over them in my own kitchen 🙂 So excited. I actually like the shape of those shells. They are uncommon and adorable. However “Enjoy the macarons as soon as possible” I don’t know about that. 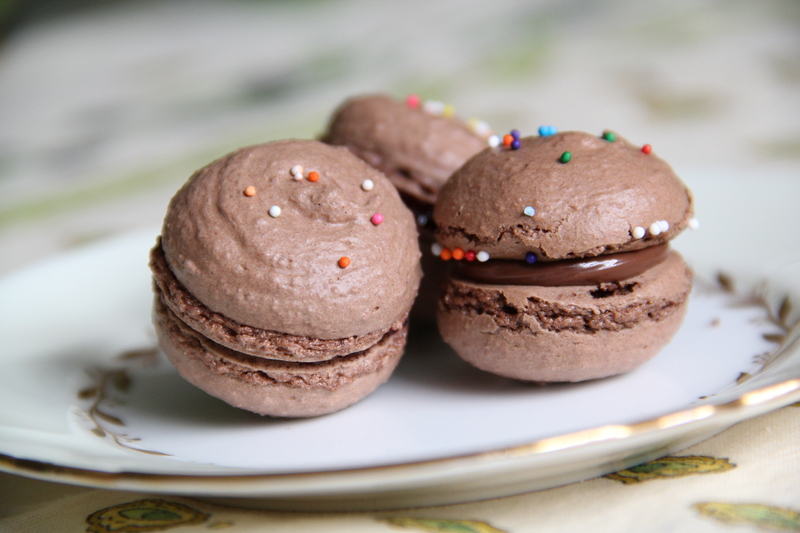 It is said that macarons are best enjoyed after a few days actually. Pierre Herme himself says so. It gives time to the rather dry shell to absorb some of the flavor and moisture of the “creamy” humid center. Macarons are the cookie equivalent of sparkly nail polish–you feel like you shouldn’t wear it every day…but why not? I am totally making these this weekend!! Molly these are adorable! I want to hug them first, then eat them. I meant to ask you, is there any reason why one couldn’t make macarons with wheat flour instead of almond? No nut allergies here, just curiosity! thanks, Cristina! Re: almond vs. wheat flour — wheat flour contains gluten, and almond flour does not. Gluten is a protein that makes breads & baked goods denser/chewier, so, though I’ve never made macarons with wheat flour before, I don’t think I’d want to, for fear of losing that classically delicate, light and crispy shelled texture of these little guys. If you do try substituting wheat flour, though, please let me know how they turn out! Hi Molly, is it possible to make these without a standard mixer and whipping by hand instead? I’m still in the process of moving and don’t have a mixer yet, but I really want to make these! Hi Emily! It is possible, though much more difficult, to make them by hand. Just requires a lot of elbow grease — you can do it!